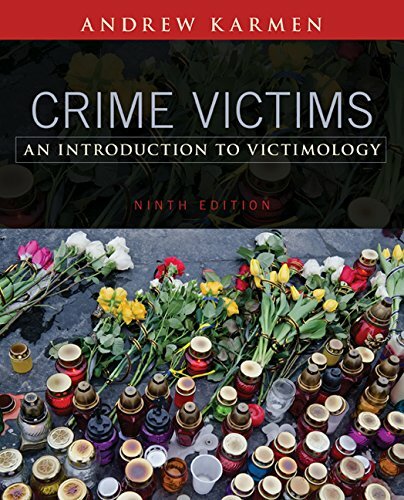 1305261038 -A first in the field when initially published and now a true classic, CRIME VICTIMS: AN INTRODUCTION TO VICTIMOLOGY, Ninth Edition offers the most comprehensive and balanced exploration of victimology available today. The author examines the victims’ plight, carefully placing statistics from the FBI’s Uniform Crime Report and Bureau of Justice Statistics National Crime Victimization Survey in context. At the same time, he “humanizes” victims’ stories through compelling case studies. The text systematically investigates how victims are currently handled by the criminal justice system, analyzes the goals of the victims’ rights movement, and discusses what the future is likely to hold. This Ninth Edition presents current coverage of the seriousness of intimate partner violence, child abuse, sexual assaults in the U.S. military, acquaintance rapes on college campuses, shootings on campuses, whether arming for self-protection is an effective strategy, and similar high-profile issues. It also includes new information about “survivorology” and “bystanderology” as well as new material on practical issues facing victims.